Will the Unichip increase my low end torque and my high end horsepower? Long answer – Although they’re commonly synonymous with high and low rpm performance, horsepower and torque do not represent the same thing and they are not produced at different parts of the engine power curve. Unlike bolt-on modifications, with the Unichip your engine can create more torque at all rpm’s which, in turn, means your engine makes more horsepower at all rpm’s. Technical answer – Although the terms horsepower and torque are often incorrectly used interchangeably, they actually describe different phenomena. Torque is power. Horsepower is work. Where r equals the length of the distance between the where the force is applied and the center of rotation and F is the amount of force. If you place a wrench on a bolt, the amount of force you apply to the wrench and the length of the wrench determine the amount of torque – or twist – applied to the bolt. If the wrench is two feet long, and you pull with 100 pounds of force, you’re twisting the bolt with 200 lb-ft of power… or torque. Where T is torque, rpm is engine speed, and 5252 is a constant. In reality, both the diesel truck and F1 engines perform well when put into vehicles designed to take advantage of their strengths… diesel trucks need to pull strongly at low rpm so they last for years while F1 cars must be very light and produce very high power for short race periods. Engineers design drive trains to allow those engines to work efficiently while the vehicle does what it’s designed to do. To understand that efficiency, you have to look at the transmission/final drive gear ratios and where the engine is at its peak torque. o First, I talked about using a 2 foot long wrench to torque a bolt to 200 lb-ft which is a good pull but still something most guys could easily do. That’s no more Torque than most small car engines produce so why don’t we have human powered cars? It’s not the power, it’s the work. While the car engine makes the same 200 lb-ft of power, it can do it while spinning the bolt at 5000 rpm. You can make the power, but at about 2 rpm… for about 2 minutes, while the car’s engine can do it until it runs out of fuel. With that in mind, consider a “typical” diesel truck and a “typical” F1 car in three different situations… first at 30 mph, then at 60 mph, and finally at 120 mph… and let’s see what they’re doing. At 30 mph, the truck engine is spinning at just 1568 rpm, is in the heart of it’s power band, and with the drive train’s 5.33-1 total mechanical advantage the truck is putting some impressive numbers to the drive wheels and it’s ready to uproot some trees. This is what the truck is built to do and this is the spot it’s built to do it in. The F1 engine is also at a moderate 8000 rpm (for an F1 engine that is, they idle at ~ 6000 rpm) and is still well below it’s power band but because the engine is spinning so much faster than the drive wheels, the engine enjoys an 11-1 total mechanical advantage through the drive train allowing it to also put some impressive numbers to the drive wheels. You can see why these cars that weigh under 1400 lbs including the drivers accelerate like they do. At 60 mph, things are changing. The truck has shifted into fifth gear because of the engine’s low redline and the engine is already moving out the top of it’s peak power band as the engine’s volumetric efficiency begins to exceed the turbo’s capability. The engine is still making 83% of the power it made above, but the work being done through the gears at the tire contact patches have decreased by almost 70% because the mechanical advantage is down to 2.48 as the transmission is running out of gears. The F1 car is still in first gear and approaching it’s power band and – because of the engine’s very high redline – still enjoys the 11-1 mechanical advantage… while the truck’s road wheel power is way down, the F1 car’s power at the contact patch has almost doubled. At 120, the story is complete. The truck is still in fifth gear, the engine is running out of available rpm, and power is starting to noticeably fall off… flywheel power is down by 50% compared to 30 mph and second gear while drive wheel power is down by 75%. As power is falling off, aerodynamic drag is increasing exponentially and the truck has literally hit a wall. This isn’t what a full size truck is meant to do and it shows. The F1 car, on the other hand, is like a dog that just got off it’s leash and doing exactly what it was designed for. The engine is screaming at redline making its peak power and the car is in third gear pulling hard against the increasing resistance of the air. Although drive wheel power is down because of the decreased mechanical advantage as the driver up shift, it’s still 45% higher than the truck and the car still has four more gears to go. It can’t uproot a tree, but with 1445 lb-ft and 4951 bhp at the drive wheels and several gears to go, it’s going to pull hard well past 200 mph. o Unichip tuning. 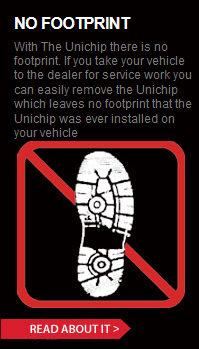 So with the understanding that an engine has “torque” at every rpm and “horsepower” at every rpm, what do you get when you install a Unichip? When we build calibrations, we optimize the Air-Fuel Ratio and ignition timing (or injection timing for TDi applications) so that all engine rpm at high load the combustion chamber produces maximum power… maximum Torque. With the Unichip, at 1000 rpm, the engine makes maximum torque and it does so at every rpm value all the way to redline. That means – by definition – maximum bhp at every rpm as well. So, whether you want to talk about power or work, Torque or bhp, the Unichip produces the most your engine will make.